Devils and witches and ghouls, oh my! Demonic, scary and grisly costumes will be out on the streets Halloween night, but they are forbidden images at many local schools. Private schools, particularly those with a church affiliation, set limits on what youngsters may pretend to be. Several island churches plan parties Monday as an alternative to the Halloween door-to-door treat-seeking tradition. » Hawaii Kai: Free games and rides for children and music by Sean Naauao and Tiny Tadani are planned for the Fall Fest from 6 to 9 p.m. at Kaiser High School, sponsored by New Hope Christian Fellowship Hawaii Kai. » Aiea: Storyteller Rob Evans, "The Donut Man," will entertain, along with carnival booths, games and prizes, at Family Fun Night from 6 to 9 p.m. at Calvary Chapel, 98-1016 Komo Mai Drive, Aiea. » Kailua: Bouncers, games, prizes and free food will be found at the Keiki Carnival at Kailua Church of Christ, 400 Maluniu St., from 5:30 to 9 p.m.
» Liliha: Food, games and prizes are available for children at the Penny Carnival at United Church of Christ, 467 N. Judd St., from 6:30 to 8:30 p.m.
» Wahiawa: A costume contest, games and free food will be part of Family Fun Night at Wahiawa Christian School, 1710 Royal Palm Drive, from 5:30 to 7 p.m. Many schools and churches have joined, or are sensitive to, a national trend to sanitize Halloween. Concerns for the physical safety of children have long since led to confined parties as a substitute for door-to-door trick-or-treat adventures. Concerns for the souls of young adventurers have surfaced in recent years among some Christian groups who find there's danger in invoking the devil or witches, even in a mass-market flame-proof costume. "We believe there is a battle for the minds and souls of our children," said Ed Arcalas, principal of the Calvary Chapel Christian School in Aiea. "I'm a parent myself. It's not like we shelter them. Our principles are to build up the kids in Christ and teach them to discern, to make choices." It will be uniforms as usual Monday at the school. In the evening, Calvary Chapel sponsors one of the biggest "alternatives" to Halloween and opens it to the community. Costumes are acceptable at Family Fun Night, but, said Arcalas, they are "less ghoulish and more likely to be movie characters," and candy and prizes are available even if kids just show up in their own faces. Our Redeemer Lutheran Church on University Avenue entertains the kids in the parking lot where they circle the SUVs and vans for a "trunk or treat" distribution of goodies and costume parade. They canceled the costume parade at Our Redeemer Elementary School as much for timesaving concerns as theological ones. "The children are disappointed, but they can wear costumes after school," said Vonnie Jo Alle, department head for grades K-5. "When they have worn costumes, they get all wound up and silly. We did try to limit it to Bible characters or favorite heroes, then some parents would buy kids a Frankenstein costume or do ninjas. Now we focus on fun, little parties in classrooms, with the theme of a fall harvest, being thankful for the crops and the blessings we have." Alle said she will carve pumpkins for her first-graders: "I do hearts as the eyes, a cross as the nose and the fish sign for the mouth. With the candle, it's Jesus' love shining out." The older students in Lutheran High School do not observe Halloween at school, and that's all Principal Art Gundell had to say about it. It is the same at Hawaii Baptist Academy. "We don't recognize it as a holiday," said Vice President George Moyer. "There are perspectives as a Christian which are best handled through the churches." 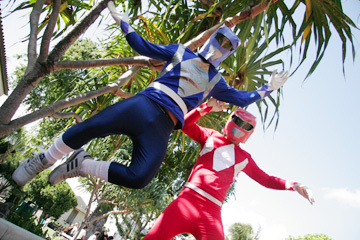 As Power Rangers, Bennett Pang, left, and Aaron Yamasaki got into character at Punahou High School yesterday. The costumes are done with major planning at St. Andrew's Priory School, where each class in middle and high school picks a theme, such as royal courts, just the ticket for girl-kind make-believe. "Costumes, yes, as long as they are not dressing with things to do with death, evil, violence," said the Rev. Susan Champion, priory chaplain. "No ghosts, skeletons, witches; no weapons. We are not about witches and evil. We are having harmless fun dressing up." The Episcopal Church is one of the denominations that celebrate the reason for the Halloween season. All Saints Day on Nov. 1 commemorates "all the faithful Christians who have gone before us and are still present with us in spirit. We do not believe they are coming back as evil spirits to haunt people," said Champion. "We believe they are still praying for us and care for us." All Saints' Day, or Allhallows, is one of the most ancient Christian feast days, she said, observed first in Ireland and adopted throughout the early church by the ninth century. The night before became "Hallow Eve," and its connection to dead saints led to the obvious spin on ghosts and ghouls; the sacred segued into secular imagery ages before our own. Some fundamentalist Christians find the holiday's deeper history to be scary. When the Celtic Christians picked the autumn to remember the saints, they borrowed the timing from the pagan Druids of their day. Adapting a festival was a conversion tactic for early Christian missionaries, and Christmas is another case of borrowed timing. Billy Zwick and Kristen Johns portray Captain Jack Sparrow and Wench. Paul O'Brien, principal of Maryknoll Elementary School, said children don't know the origins of witches, ghouls and ghosts. "I've been in Catholic schools most of my life, and I have never encountered resistance about this being a pagan thing. Kids said they like to dress up, use their imagination and be someone different. If kids come dressed as a witch, I don't care. What we don't want is competitiveness with expensive costumes, or something they can't walk in it. We don't want the older children terrifying the little ones with gory, bloody masks." Maryknoll has timed its quarterly "Spirit Day" to coincide with Halloween. It's a free dress day instead of uniforms. The costumes will come out after a picnic lunch outside. There are limitations: no weapons, nothing depicting violence, no dress code violations like underwear showing or bare midriffs. There will be a parade but not a contest. And, said O'Brien, knowing the fun will continue after school, there will be no homework. Brother Greg O'Donnell, president of Damien Memorial School, said "high school boys aren't into Halloween," but they did turn out in costumes, geared to sports figures and personal heroes, during the recent school pride week. As for the devils and witches and ghouls issue, O'Donnell said: "There is evil in the world. I don't think a 7-year-old dressed up in a devil costume is the embodiment of evil. People who take this so seriously need to get a sense of humor."